Pho­tog­ra­phy pod­cast #80 talks about how to clean your DSLR camera’s sen­sor. It describes the wet tech­nique and the dry tech­nique and it’s not as scary as it seems. 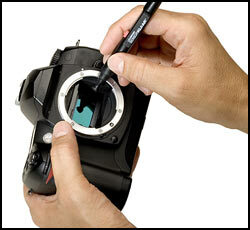 We also talk about how to clean your camera’s mir­ror as well as clean­ing cam­era lenses and gen­eral cam­era care. Hat tip to pho­tog­ra­pher Dominic Fuiz­zotto for his insight on sen­sor cleaning. Thanks to Jimmy Brown,‚ Wicked­dark, jack label, Fortytwo and Zenon5940 who posted a blog com­ment about our last pod­cast. Thanks as always to every­one that sent com­ments by email about our last pod­cast. Although ALL com­ments are appre­ci­ated, com­ment­ing directly in this blog is pre­ferred. Thanks as well to all the new mem­bers of the bul­letin board. Thanks to Jimmy Brown,Â Wicked­dark, jack label, Fortytwo and Zenon5940 who posted a blog com­ment about our last pod­cast. Thanks as always to every­one that sent com­ments by email about our last pod­cast. Although ALL com­ments are appre­ci­ated, com­ment­ing directly in this blog is pre­ferred. Thanks as well to all the new mem­bers of the bul­letin board. Pho­tog­ra­phy pod­cast #51 talks about how to clean the out­side of your cam­era, your cam­era lenses and the inside of your cam­era. I also share some tips on avoid­ing all this dirt in the first place. Spe­cial thanks to Kate from our pho­tog­ra­phy forum who sug­gested this podcast. NOTE: When I talk about UV lenses I’m actu­ally refer­ring to a screw on UV fil­ters. My bad. Thanks as always to Rifter, Susan, Jon, LanceJ, and scorpio_e, Begin­ner, candyman123, trot­ters, Nata­nis and dclark‚ for recent com­ments and sug­ges­tions. We LOVE com­ments and sug­ges­tions so please send more.